Last Friday, during a panel about Mars exploration in San Francisco, The Martian author Andy Weir revealed that after the success of his book, he had splurged on the purchase a small Martian meteorite for the hefty price of $10,000. To ward off any suspicion that he may have been duped into believing a regular Earth rock had come from a different planet, Weir assured us that he had seen the geological analysis that proved his meteorite was the real deal. This light-hearted story opens up a Pandora’s Box of serious questions regarding the ownership of foreign planetary rocks; both the ones that fell to Earth and the ones that remain in outer space. With many stones, pebbles, and boulders all over the Earth how can anyone be sure that a given rock actually came from space? Moreover, how can scientists tell when a meteorite originated from our moon or Mars? And if someone can own a piece of Mars on Earth, can someone own a piece of Mars on Mars? Along that same vein, who owns the Moon? These questions become increasingly important as more and more entrepreneurs invest time and money on the bet that they can make money selling stuff that came from space. JPL planetary scientist Ron Baalke has had hundreds of people come to him to see if rocks that they discovered were meteorites. “Less than 1 percent of these cases are actually meteorites.” Baalke said. They’re very hard to find, but there are a few characteristics that differentiate a meteorite from a rock that originated on Earth. A freshly fallen meteorite will have a “fusion crust,” which is a thin coating of glass that formed as the rock burned through the atmosphere on its way to the ground. Because most meteorites contain some amount of metal (nickel-iron), another indicator that a rock may be a meteorite is if a strong magnet is attracted to it. Ultimately, however, definitively differentiating a meteorite from an Earth rock requires knowledge of the rock’s age and composition. Earth has tectonic plates, volcanoes and a weather system which frequently recycle the rocks on our planet. In contrast, meteorites come from planetary bodies without such extreme recycling processes. Because of this, rocks that fell from outer space are generally much older (hundreds of millions of years) than your average Earth rock. Baalke said that the vast majority of meteorites discovered on Earth have come from asteroids. Asteroids are leftovers from the formation of our solar system and are usually found to be around 4.5 billion years old, about the age of the Earth itself. 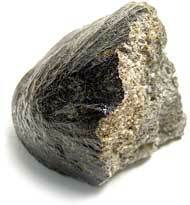 While there have been discoveries of Earth rocks that are close to this age, they have been extremely rare. If a rock is found to be nearly 4.5 billion years old, chances are it came from an asteroid. On very rare occasions, meteorites are discovered that did not come from asteroids, but rather from the moon or Mars. Planetary geologists can be confident that a meteorite came from the moon because we can match the chemical makeup of the meteorite to the lunar samples astronauts brought back during the Apollo era. Similarly, scientists can confirm the origin of Martian meteorites based on their similarity to the chemical composition of Martian surface rocks analyzed by the NASA Viking landers back in the 70’s. There are millions of asteroids flying throughout our solar system and every once in a while one of their orbits will intersect with Earth. Most of these rocks will burn up in the atmosphere and the last evidence for their existence is a bright flash of light we know as a shooting star. Some of them, however, are large enough to make it through the atmosphere and impact the ground. Asteroids also have a part to play in the other types of meteorites found on the Earth. We receive small parts of our moon or Mars because of large collisions on their surfaces caused by asteroids. If a collision is powerful enough, it can send debris flying faster than a planetary bodies’ escape velocity and out into the solar system. Some of that debris will make its way to Earth. If You Find A Meteorite, Is It yours? Fewer than 100 Martian meteorites and 300 lunar meteorites have been discovered and confirmed to date. These types of meteorites are so rare that they can be worth more than 10 times the price of gold. With such a high value it’s no wonder that there are people like the Meteorite Guy — who sold Andy Weir his Martian rock — world travelers who scour the globe on a quest to find meteorites. So what happens if someone finds a meteorite in their backyard? Is it theirs? The answer is…it depends what country the backyard is in. “In the United States, the meteorite belongs to the person who owns the land,” Baalke explained. But if someone finds a meteorite on public land in the United States, the laws are a bit more cumbersome. According to the Bureau of Land Management “collection of meteorites is limited to certain public lands.” Basically, if someone finds a potential meteorite on public property, they should ask for permission before taking it. If you’re in the market to purchase a meteorite, you’ll want to save up. Andy Weir’s Martian rock was only 31.39 grams (about the size of a large acorn) and cost a whopping $10,000, which Baalke said is actually a great price for a meteorite. Weir told TechCrunch that his meteorite came with paperwork explaining the geological analysis that had been performed on the rock validating its origin. He said many people will also have their meteorites confirmed by third parties. A list of Martian meteorites discovered to date is kept here and lunar meteorites here. Most meteorites are broken into smaller pieces in order to be sold to a higher number of buyers. Weir’s Martian rock came from the Northwest Africa 7635 meteorite which was found in Morocco in 2012. If You Can Own A Space Rock, Can You Own A Rock In Space? We’ve established that it’s possible to own pieces of planetary bodies on Earth. But who owns the rest of the moon, or Mars, or any of the asteroids? These are important questions for companies like Moon Express, which is working on the technology required to extract valuable resources from the Moon. Recent legislation, signed by President Barack Obama in November of 2015, cleared things up for many entrepreneurs planning to profit from space-based resources. The Commercial Space Launch Competitiveness Act (H.R. 2262) stated that U.S. companies are entitled to maintain property rights of resources they’ve obtained from outer space. The Moon Express MX-1 Lunar Lander / Image courtesy of Moon Express, Inc.
Bob Richards, CEO of the Moon Express, told TechCrunch that H.R. 2262 is helpful to companies like his because it explicitly outlines private sector’s rights to resources they extract in space. These same rights were only implicit in the 1967 Outer Space Treaty, which was the only relevant law prior to H.R. 2262. In an op-ed for SpaceNews, Richards compared the extraction of space resources to fishing in international waters. If Andy Weir would like to expand his Martian rock collection, there are now laws in place that would allow him to keep any rocks he extracted from the Red Planet by his own means. The hard part, of course, is developing the extraction technology itself. H.R. 2262 was a crucial step for those who are currently dedicating time and money to build out the right space resource extraction technology. The new legislation instills regulatory confidence in space entrepreneurs and their investors and allows them to rest assured that they’re operating safely within the law.